Preheat the oven to 180 °. In a large bowl beat the eggs and sugar until the volume of the mixture triple it takes about 10 minutes. With a spatula, add flour in three times, mixing gently to avoid te eggs from falling. Pass your spatula gently into the bottom of the bowl to remove any flour pockets that may form. To finish add the melted butter while mixing gently. Pour the dough into a buttered square baking pan. Bake for 25 minutes. Let cool a little before unmolding and reserve. Once the cake has cooled, cut it into 10 squares. Whip the fresh cream firmly, put it in a pastry bag and set aside in the fridge. In a flat plate pour the coconut. In a bowl mix together the icing sugar, the hot water and the red dye to make the red syrup. Take a square and soak it completely in the red syrup and then pass it into the coconut and coat it well. Continue by doing the same with the rest of the squares. Do not put whipped cream on all the cakes but only on those that you will eat immediately and keep the rest of the cakes in an airtight box for 2 to 3 days maximum to have a soft cake. Do not put your cakes in the fridge because the syrup will freeze and you will have a dry cake. 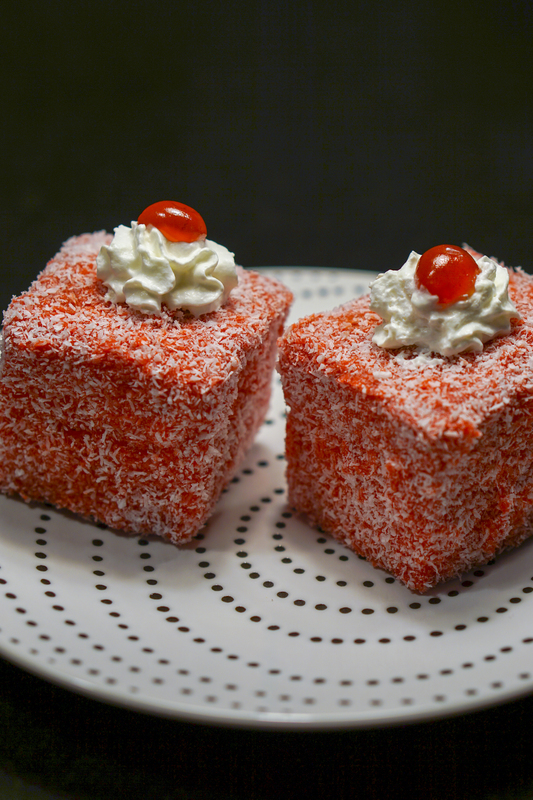 Put some whipped cream in the center of your red Lamington cake and half a candied cherry on the whipped cream. It is ready to enjoy with a good hot tea at tea time.